Wales’ largest music festival, Green Man, is delighted to today announce the first details of this year’s festival, returning once again in the epic surroundings of the Black Mountains deep in the heart of the Brecon Beacons for its 17th year. Tickets are on general sale now, with early bird tickets having sold out in record time. Last year’s Green Man sold out quicker than ever, so we recommend not delaying and picking them up as soon as possible! For those looking for the full Green Man experience, the Settler’s Pass is available, which turns the festival into a week-long holiday, allowing early access to the site from Tuesday 13th August, and including workshops, music, discounts on local heritage sites, galleries, castles and more. Following the release of her wonderfully atmospheric album Remind Me Tomorrow, Green Man are excited to announce the return of Sharon Van Etten and her powerful storytelling for the first time since 2014. Also joining us are the iconic Stereolab, who will play highlights from their ten critically acclaimed albums at this year’s Green Man following a ten year hiatus. For the first time in their 20 year career, Green Man will also welcome Canadian indie-rock collective Broken Social Scene. Formed in Bristol, IDLES will be making the short drive over the Severn Bridge for their debut Green Man appearance. The punk-rock band enjoyed an incredible 2018 following the release of their second album Joy as an Act of Resistance, which reached #5 in the UK Album Chart, #6 in The Guardian’s end of year list and was also named BBC Radio 6’s album of the year. Green Man are also delighted to welcome one of indie-rock’s biggest breakout bands of recent years, Car Seat Headrest, to the Brecon Beacons this year. 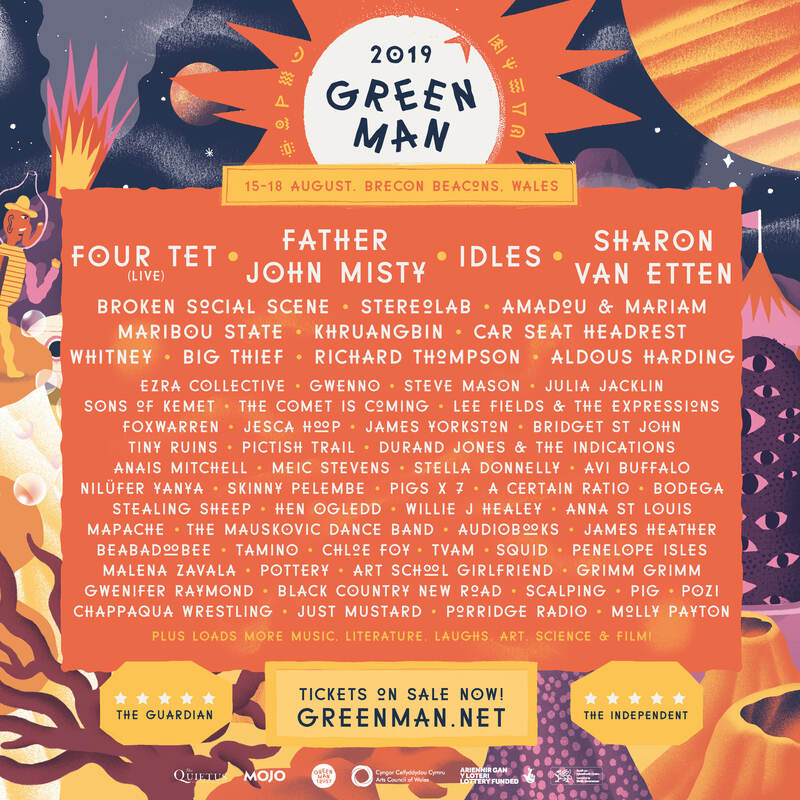 Welsh bands appearing at this year’s Green Man, include Gwenno who will be playing the Far Out stage. Her 2014 debut album, Y Dydd Olaf is 100% Welsh language. Raised with Welsh and Cornish as her first and second languages, Gwenno explores the creative possibilities of using these time-worn tongues. Welsh legend Meic Stevens will adorn the Mountain Stage with his music, achieving a timeless mysticism that perfectly suits the ancient hills and mountains encircling Green Man. Dubbed “the Welsh Dylan”, Meic has been a massive influence on home-grown bands such as Super Furry Animals and Gorky’s Zygotic Mynci and we are thrilled to have him at Green Man this year. Valleys guitarist Gwenifer Raymond harnesses the raw elements of American Old West music and makes them personal by adding her own intricate Welsh folk sound. She released her debut LP, You Never Were Much Of A Dancer, in 2018. Hopefully, she’ll do a bit of dancing in her first Green Man appearance on the Walled Garden stage this summer. Next, Green Man are over-the-moon to declare that country-soul band Whitney will be joining us for the third time in four years; joining them will be Big Thief who are going on a UK tour in May which includes a huge date at London’s Roundhouse; a favourite from Green Man 2017, Julia Jacklin makes the trip from New South Wales to the idyllic setting in South Wales to perform her new album Crushing – out in February 2019; another from the Southern Hemisphere, Aldous Harding, makes her second appearance at Green Man; whilst Richard Thompson released 13 rivers in 2018 – his 18th studio album – and continues to tour worldwide and will return to Green Man for the first time since 2008. For full ticket information, visit greenman.net.